A few simple adjustments can help your TV produce a more accurate picture. We'll show you how. So you’ve just plugged in and turned on your brand-new TV, but you’re disappointed in the quality of its picture. Don’t reconsider the salesperson’s pitch to send a technician to your home. That’ll cost you at least a couple hundred bucks. We’ll show you how to calibrate your TV to get the best picture it’s capable of, and some of our recommendations won’t cost anything more than your time. Before we get started, know that the vast majority of TVs now come from the factory set quite accurately. Choose the “home” option at first setup and you might be perfectly happy with the image quality. If that’s the case, spend your time watching a great movie instead of fiddling with the TV’s controls. But if you’d like to milk the last couple percent of image quality from your TV, we’ll guide you through the process. Just Just don’t expect your $500 TV to all of a sudden look like it has quantum dots or OLEDs onboard. High dynamic range (HDR) is the newest feature to come to HDTVs. 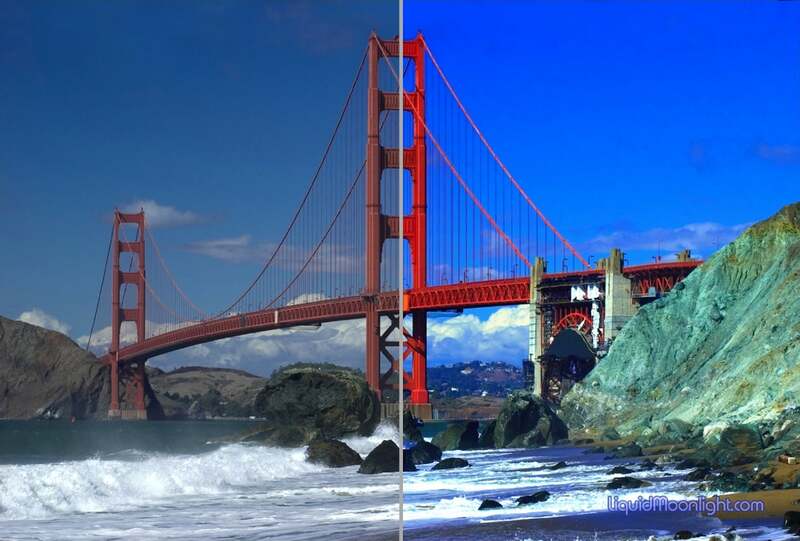 Just in case all the work the content providers and vendors have done to make HDR self-calibrating doesn’t suit your taste, these same methods can be used on some HDR TVs. Others will lock you out. The first step in your calibration process is to make sure your TV is set for in-home use and not store demonstration mode. You could also call this step rudimentary calibration. It shouldn’t take more than 10 minutes, and all you need is a few test images and your eyes. You can also use a meter, but that’s for later. So grab your remote, head to the picture settings and read on about the various things you might need to adjust. We’ll get to the finer points and true calibration in a bit. Brightness: This is actually nothing like what you do with a common household dimmer switch; it’s a black level control, i.e., what level of brightness (or lack thereof) is considered absolute black. Increase the value to raise it, decrease the value to lower it. Visually, it seems to have much the same effect as a dimmer, but there’s a subtle difference as you’ll see when we discuss contrast. With this image on the screen, adjust your TV’s brightness control until the THX logo’s shadow is just barely visible. To get this image on your TV, click to maximize it and then right-click to save it to a flash drive you can plug into your TV. Contrast: Again, this doesn’t really adjust contrast—i.e., the difference between adjoining light and dark areas—it changes the white level, or what hue is considered absolute white. So, brightness = black level, contrast = white level, and the difference between the two is your actual contrast level. That’s why it’s a good idea to revisit brightness after you adjust contrast, and vice versa. The image below, also from THX, provides a good contrast test pattern. 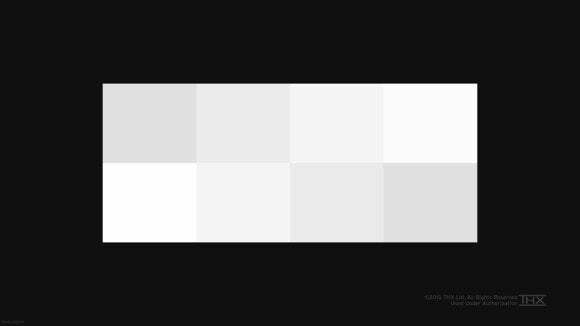 If you can clearly see all eight gray rectangles, your contrast is fine. Backlight: Now this is a brightness control, but it only applies to LCD TVs or other types that use a separate source for luminance. OLEDs don’t have this because the light source is the diode itself—not a light shining through it. Increasing the strength or luminance of a backlight will result in a brighter picture, but it will also increase bleed around the edges of a TV as well as from the LCDs themselves (which are not perfect shutters). On some TVs, you can almost completely wash out the colors by increasing the intensity of the backlight. Don’t do that. Generally speaking, leave the backlight as low as possible for the ambient light conditions. You might also want to turn off adaptive brightness, which changes the strength of the backlight according to said ambient lighting. When left on, it will temporarily undo any adjustments you make to backlight intensity. Color: This TV term actually sits closer to its mundane meaning, but refers to the intensity of color, or in industry-speak—saturation. That’s not the hue or RGB makeup of them—that’s in the fine settings we’ll cover later. Turn this up too high, and the colors overwhelm the details. Too low, and voila! You have a black-and-white TV. Now if you want to de-colorize old movies, just turn the color all the way down. Adjust saturation using The Simpsons. When the outlines are still visible—but the colors are vibrant—you’re right on. Saturation settings are easily done by eyeball. When you start to notice detail declining, you have just more than enough color. 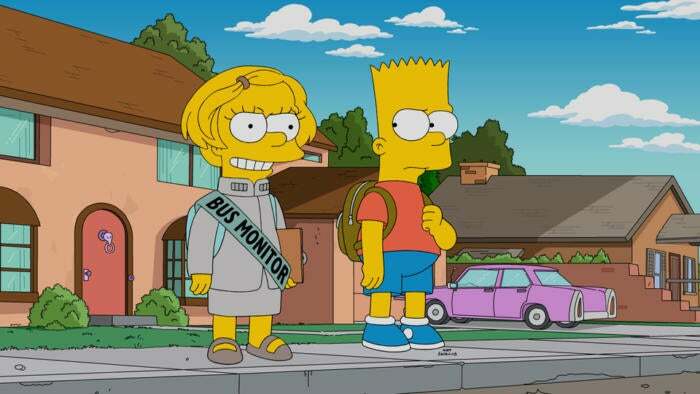 In practical terms, when Bart Simpson’s skin color starts obscuring his outline, you’ve gone too far. And yes, we just recommended using The Simpsons for testing. Tint: On some older sets, this might be called Hue. Originally designed to correct phase errors in communications between TV tuners and broadcasts, it modifies the proportion of red or green in each non-black color. The odds of your having to adjust this these days are negligible, but if your favorite star’s face is looking a little green around the gills, use the tint setting as the stomach remedy. Sharpness: This is the level of perceived detail and the sharpness of edges that you’ll see in an image. These days it basically adjusts the anti-aliasing algorithm used by the TV’s image processor. Too much and you’ll see jagged, confused edges; too little and detail gets muddy. This is all according to taste, but TVs generally ship adjusted to “mild cheddar;” that is, a level that most everyone will find acceptable. We tend to tweak it slightly sharper, though this can lead to moire, shimmer, and an accentuation of any motion artifacts your TV exhibits. Motion: This is an adjustment that, like sharpness, involves a trade-off. In this case, however, it’s between reducing artifacts such as stutter in action sequences and pans, and retaining detail. If you want to see how much detail you’re losing, pause in the middle of a fast action sequence and study the edges. A before and after calibration picture from SpectraCal. If you see this kind of change, you’re TV settings were a colossal mess. It’s unlikely you’ll see this kind of improvement. The difference from this setting can be dramatic—if your TV has the chops. Most TVs with 60Hz refresh rates suffer at least some occasional judder or jerkiness, while 120Hz models rarely do. The extra cycles smooth frame rate to refresh cycle conversion errors, and TVs in that class employ better CPUs. You can ignore the rest of the phrases and numbers vendors throw at you—it’s just their way of saying they try to ameliorate motion issues. Adjust to taste. We like smooth. Image size: Also known as Aspect Ratio. Most modern content features a 16:9 aspect ratio. Nearly all TVs in the flat-panel era have the same 16:9 ratio and the two marry perfectly. A lot of older movies and some TV broadcasts, on the other hand, use narrower aspect ratios and should be displayed pillar-boxed; i.e, with vertical black bars on the left and right. True 4K or 4096 x 2160 (17.1:9) would be slightly letter-boxed, or with small black borders at the top and bottom of the display—just like high-resolution content displayed on a display with a 4:3 aspect ratio. If everyone looks unnaturally thin or thick, or images appear truncated, you have the wrong setting. The settings you want are called 16:9 or Wide for HD (720p), FHD (1080p), or UHD (2160p) content, and 4:3/Standard for broadcast or older movies. A modern TV should correctly sense the signal and automatically adjust the way it’s displayed—unless you override it. Now let’s get down to the nitty-gritty, or what most people consider calibration. If you look around in your TV’s advanced settings, you’ll probably run across some complicated-looking stuff: color temperature, gain, and offset for red, green, and blue; white balance; and gamma. You can try to eyeball these settings, but as the differences can be so fine, you’d probably be better off with a hardware assist, which we’ll discuss next. You can mess your picture up in a hurry with these fine settings, but they’re also the path to the last few percentage points of image accuracy. 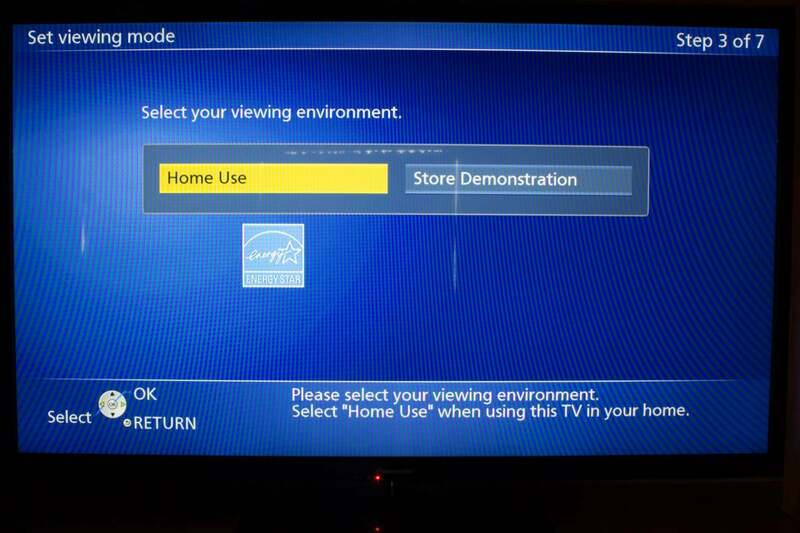 We can’t take you through the advanced settings of every of TV, but we can tell you about the most common settings and what they do. 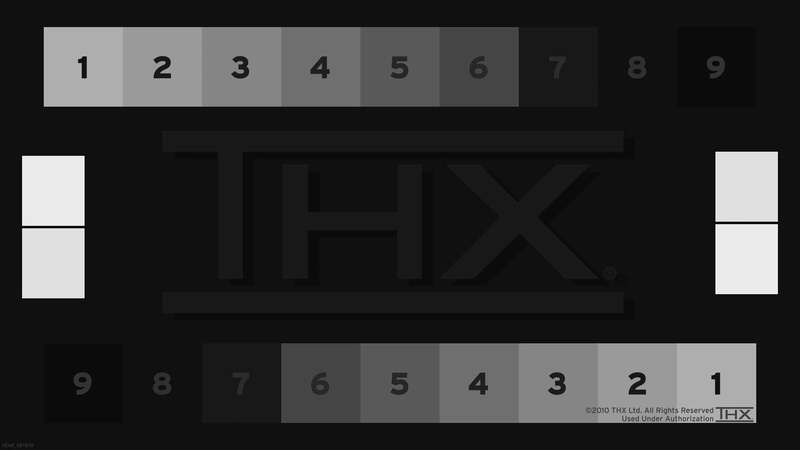 Temperature: Color temperature settings affect the intensity of color across the spectrum in what’s basically a curve. They generally offer only a few choices that conform to industry standards. In effect, these run from cool (accentuating the blue end of the spectrum) to warm (the red end). Try the various temperatures before you mess around with the fine settings described below. We recommend you stick with the default unless you’re trying to match the output of another device or medium. About 5800K closely mimics sunlight. White balance: This goes hand in hand with the RGB settings below, because they are what you use to correct the white balance. The basic idea is to adjust the red, green, and blue levels so they mix to achieve a pure white. With technology capable of producing pure red, green, and blue this would be easy. Quantum dots come close, but no other technology really does, so this will generally be an approximation and you’ll need to decide if you want a warm or a cool white. RGB gain and offset: If your colors are skewed towards red, green, or blue, you can reduce or increase their level using these controls. Generally, you’ll use a white image and adjust the component colors so the image is actually white, or as close to it as the TV will render it. Also see White Balance. Gamma: In several paragraphs, we could tell you what gamma is exactly (it has to do with interpreting a color space in terms of luminance). Instead, think of it as a mid-range control for your image. Mids like in audio. Gamma doesn’t affect white or black, but the colors in between. Too high a setting and they’re too dark; too low and they’re too light. The goal, unless you’re trying to match the output of another type of device, is to retain detail in dark areas, while not blowing it away in lighter areas. No, we’re not talking about calling tech support. This is about using THX’s Tune-Up app, which is available for both Android and iOS devices. Install it on your smartphone, connect the phone to your TV via HDMI, and the app will display calibration images (we used some of the older ones above), walk you through adjustments, and measure levels using the phone’s camera. It’s free, aside from the video adapter you’ll need to display its images on your TV (you could use a Chromecast, but compression might prevent you from getting accurate colors). Run this free THX calibration app on your tablet or smartphone (Android and iOS versions are available) and you’ll have your TV image in tip-top shape in no time. Now if you’d like really like everything as close to perfect as possible, but don’t want to spend a lot of hours being certified or learning about calibration, there is an alternative: SpectraCal offers auto-calibration via a combination of a high-quality color/light meter and software. It’s called called the CalMAN Enthusiast bundle, and it costs about $1,000. 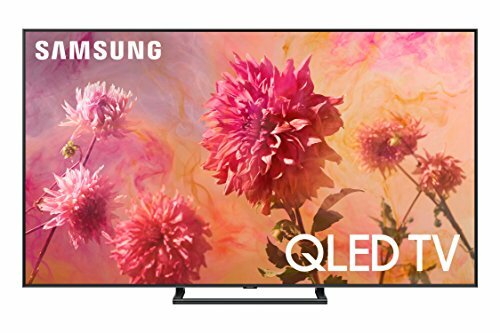 With any TV or projector that supports it, which includes models from JVC, Panasonic, Sharp, and now, significantly, Samsung’s top-of-the-line QLEDs, you can use the AutoCal function to automatically adjust the settings in a few minutes. Depending on the TV, generally all that’s required is pushing a button or two and running the meter over the display surface. Sweet. If you have the right TV and hardware. SpectraCal has hinted at offering less-expensive and more widespread implementations of automatic calibration technologies in the future. A major part of the wide color gamut (more colors) and HDR (high dynamic range) movement, aside from a dramatically improved image of course, is the desire to automate the calibration of TVs and content so you get as accurate a portrayal of what the producers created as possible. Hands-free. With HDR, the player queries the TV on its capabilities, the TV responds, and then the player tells the TV what it needs to do to best render the picture using information embedded in the content itself. The TV does the best it can, and that best varies wildly from slightly brighter to light sabers that jump right off the screen. Nearly all the tweaks are the same for HDR, but you might find queries about color spaces such as REC 709, sRGB, or—with a very good TV—BT.2020. In all likelihood, any manual tweaking you could do will have minimal effect. At least that’s been our experience so far. But don’t let that stop you from trying. Far be it for us to tell you what you want to do with your TV. Calibration is actually kind of fun and our own vintage SpectraCal is a hoot, albeit in a much geekier, number-heavy fashion. And there’s always the reset button. No, mis-calibrating your TV won’t break anything. We were pleased results with the THX app, satisfied with what we came up with using the standard adjustments, and to be honest, satisfied with the picture without any tweaking at all. It didn’t hurt that the TVs in question were the Samsung Q9F and Sony A1E. If you’re not so lucky, have at it and let us know how you fare.